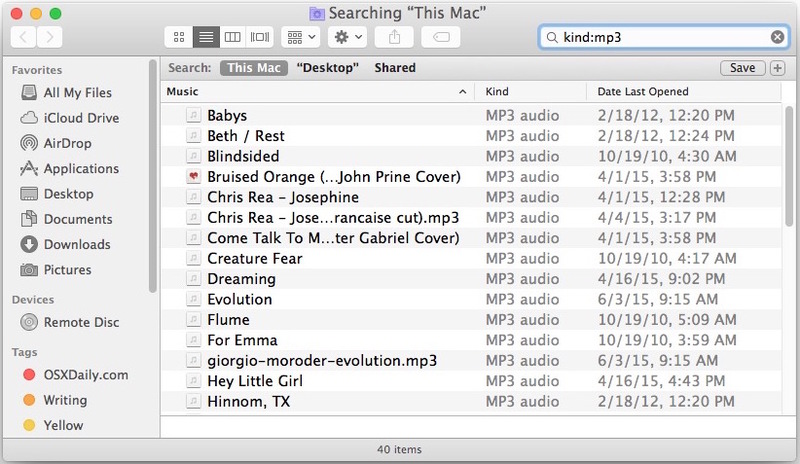 Mac users who are searching for specific file type and file format matches on their computer can make the job dramatically easier by issuing proper search operators to the Find functions in Mac OS X. 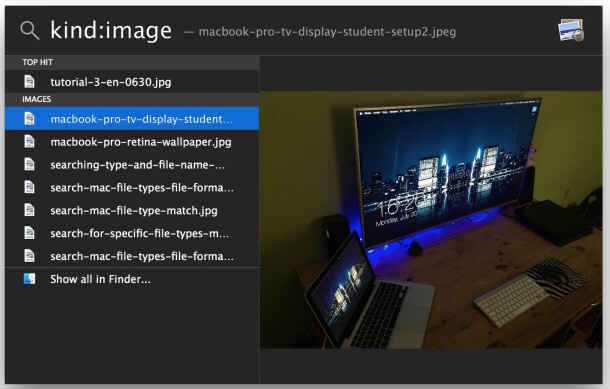 File type search operators can be used directly in Spotlight and also in the Finder based search function, and they can be either very specific to a particular file format (for example, a JPEG), or more general to a file type (for example, a movie). 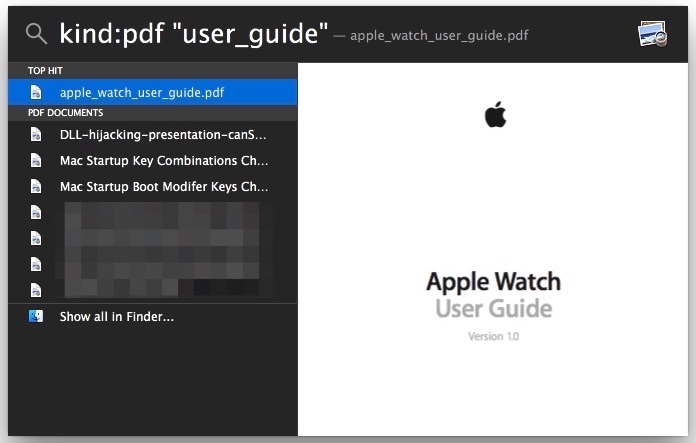 Let’s walk through some examples of how to use these to look for and match a variety of file types and file formats in Mac OS. As a quick reminder, you can open Spotlight search by hitting the Command+Spacebar key combo from anywhere in Mac OS and Mac OS X, and you can open a new Finder search with Command+F from anywhere in the Mac file system, desktop, or Finder. File type search operators can be things like ‘image’, ‘movie’, ‘music’, ’email’, ‘application’, ‘text’, ‘archive’, etc. If used in Spotlight (command+spacebar), the matches will be listed by most recent usage, but you can click on the “Show all in Finder” option to see all matches for the search type. 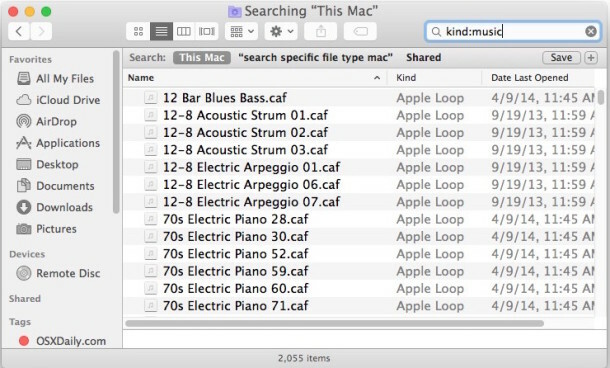 If the kind:type operator is used in the Finder windows, it will default to searching the entire computer for matches of that type (in the prior example, all images, or in the below example, all music). 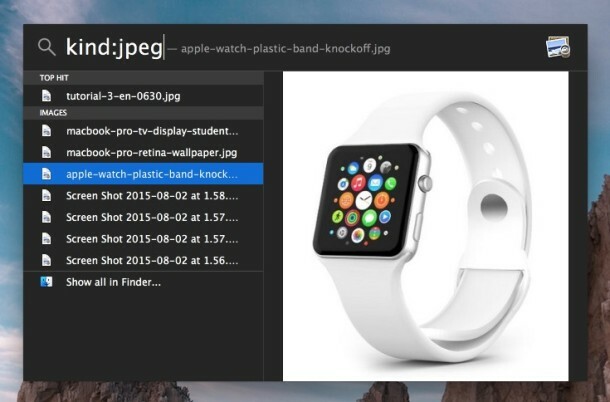 File format search operators are quite literal, meaning you can specify something like ‘jpeg’, ‘gif’, ‘aiff’, ‘pdf’, ‘rtf’, ‘psd’, ‘mp3’, ‘zip’, or basically any other file format. Just like before, you can use these operators in either Spotlight, or with direct Finder searches. kind:(operator) "text to search match"
This works great if you know a general name and file type but can’t remember the file format or exact name (for example, if you know it’s an image file and had the text ‘iPhone’ in the file name, but can’t remember the exact file itself). Search operators are very powerful and can make locating things on the Mac much easier, whether you start from the Spotlight search feature or a general Finder based file search. You can learn more about general Spotlight search operators for OS X here, or read a few more specific use cases, like locating large files on the Mac with size searches, or finding files from a specific date with another operator set, or even searching system files in Mac OS X. Know of any other handy uses of search operators on the Mac? Let us know in the comments. Very concise and practical advice, thanks. You can also search by tag colors or names using tag:red or any custom tag name you created. Or you can use the free (and much easier IMHO) “EasyFind” app by Devon-technologies.com. I have no affiliation in any way shape or form with them, other than being a long-time user. Amen, Amen to the Easy Find! Thank you Ken for ending years of frustration! Or use EasyFind and just not be bothered by Apple’s poor search implementation. The various search operators work in all versions of OS X which have Spotlight, should go back all the way to 10.1 or so. Don’t forget to search for dmg files and already unzipped archived. Absolutly space waisting. How to find file without searching inside file content. I don’t want to find mentioning of that file in other files, just this file.